Peggy was born in 1933 in 2 Chapmans Terrace. When she was two, Peggy’s family moved to Crawford Road. The energy source of the house was gas rather than electricity. Allcroft is Peggy’s married name, her maiden name was Pearman which is an old Hatfield family. Peggy’s grandfather lived in Bush Hall Lane and fought in the First World War. 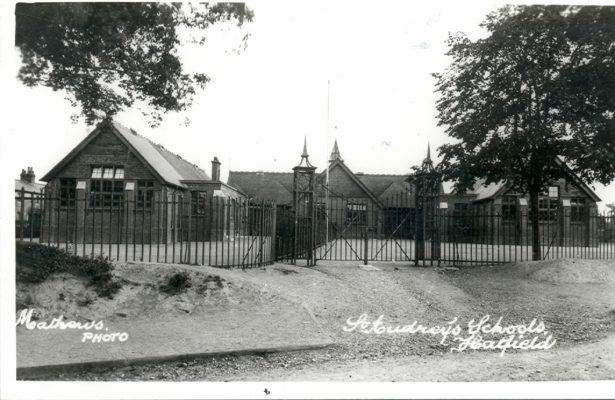 Peggy’s first school was Newtown Primary school on Dellfield Road. Newtown school received food parcels for families in Hatfield from New Zealand in 1941 when Peggy was eight. Each parcel the school received had the name of the child or the family the parcel came from on it. After all these years, Peggy still writes to the girl who sent the parcel she received. St Audrey’s school was destroyed by a flying bomb during World War Two. The bomb hit the school at 4am, so thankfully the school was not full of children, although there were casualties in the area. A temporary school was set up in the Public Hall in Hatfield, where there were six classes to one room. St Audrey’s school was rebuilt and in 1946 the children moved back to the school for their lessons. Peggy stayed at the school until 1948 when she was fifteen years old. Peggy’s first job was for Jack Olding who made Caterpillar tractors. She worked there for two years and then moved to work at RDC. Peggy then worked for Murphy Radio in Welwyn Garden City. Her last job before she became pregnant was at the box factory in Hatfield. In 1971 Peggy worked at Hawker Siddeley, which later became British Aerospace. She took voluntary redundancy in 1991 when it was to be closed. This page was added on 04/03/2011.